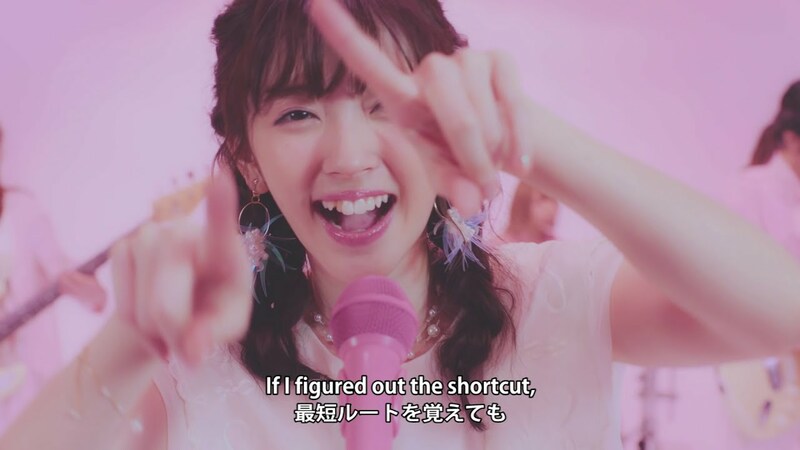 Here for Suzuki Airi 101? Well, the former C-ute member spent much of her time in the much loved subunit BUONO! with fellow Hello! Project Kids standouts Natsuyaki Miyabi (now in PINK CRES.) and Tsugunaga Momoko (now retired from entertainment). BUONO! Focused on music that had more of a rock edge than what’s normally found in Hello! Project, which explains why Airi seems determined to continue performing music with a rock edge. “Hikari no Hou e (To the light)”, the collaboration with Akai Koen, may not be the head banging anthem, but rock musicianship is solid with some especially tasty bass licks and a funky guitar line. The pop song features Airi and Akai Koen in all shades of pink while Airi smiles winks for the camera. From appearances, all parties involved look to be having a grand time in “Hikari no hou e”, and Akai Koen look especially gleeful when they get to cut loose in the song’s noisy bridge. “Hikari no hou e” simultaneously delivers the rock side of Airi and the wildly cute side of the girl. You can find “Hikari no hou e” on Suzuki Airi’s debut album “Do me a favor”, out now.